Want a vegan white chocolate bar? We've got you covered. Here are 12 varieties of white chocolate bars that are dairy-free and delicious. 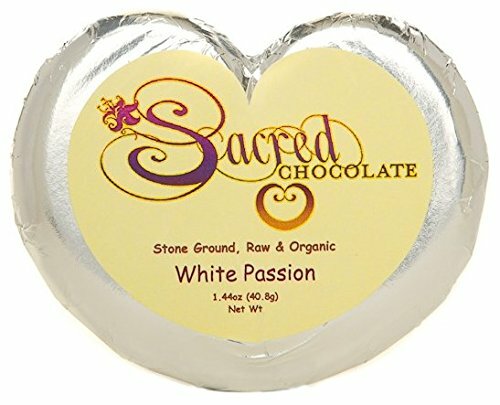 This organic vegan white chocolate has that bitter but rich cacao taste. It does have a robust flavor so it’s probably not the best for baking but if you just want some white chocolate to munch on or put in a trail mix this would work great. Ingredients: Organic Cocoa Butter, Organic Rice Milk Powder (rice syrup powder, rice starch, rice flour), and Organic Cane Sugar. This bear has an original chocolate taste. The same sweetness that you would see in a regular bar is in this one too. It does use a good amount of cacao, but it also uses hazelnut to offset the bitterness that cacao has. On top of the hazelnut, which can be pretty sweet on its own, it has 3 different kinds of syrup. So, when they say this bar is sweet they mean it. Ingredients: raw cane sugar*, hazelnut paste* 23 %, cocoa butter*, rice drink powder* (rice syrup*, dried) 11,5 %, hazelnut brittle* 8% (raw cane sugar*, hazelnuts*, corn glucose syrup*, caramel syrup*) bourbon vanilla extract*. cocoa solids: 29 % minimum. This white chocolate has a fairly good taste, but the descriptors can be misleading. It’s definitely a white chocolate, and many people expect it to be pure white but the “golden” part of its name is a real thing, it does have more of an off white or yellowish color. But this does not affect the taste. It’s still amazing and melts well though you probably won’t get to the melting. Ingredients: Organic coconut palm sugar, organic raw cacao butter, organic raw cashews, organic coconut powder, organic Madagascar vanilla bean blend, pink crystal salt, organic vegan flavors. 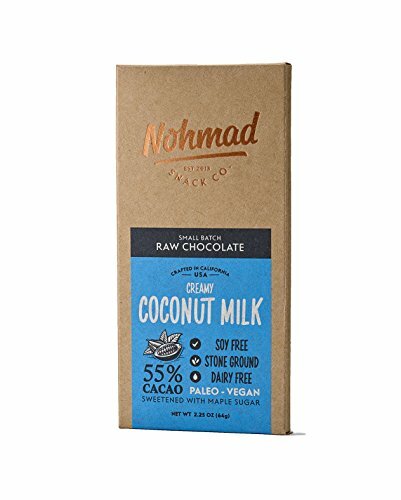 This chocolate is very smooth and unlike a lot of vegan white chocolates it doesn’t have a nutty flavor, or a bitter taste from the cacao. The coconut milk helps this bar to have a really even taste. It’s nice and sweet and melts really well too. Ingredients: Organic Raw Cacao, Organic Maple Sugar, Organic Raw Cacao Butter, Organic Raw Coconut, Vanilla Bean, Sea Salt. This cute chocolate heart will find a place in yours the first time you taste it. Its maple sweetened so it does have a kind of syrupy flavor as opposed to smooth milky one, but it’s still good. It also has a little bit of lemon to cut the maple sweetness so it’s not too overwhelming. Only downside is the melting can take a while. Ingredients: Organic Cacao Butter, Organic Maple Sugar, Organic Coconut, Organic Cashew, Lemon Essential Oil, Organic Vanilla Bean, Himalayan Salt. This white chocolate is notorious for being extremely good. The only issue some people have with this is it not being fresh when they buy it online. Other than that, there’s no complaints. It’s sweet and has the perfect chocolate taste. Would be great for kids! Ingredients: raw cane sugar*, cocoa butter*, rice milk powder* 18%, tiger nut semolina*, bourbon vanilla pods* (ground). * from organic agriculture. Very plain ingredient statement. 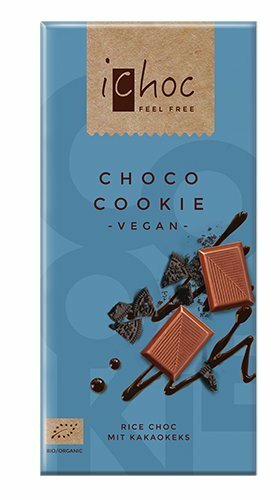 Would be a great chocolate bar for putting into cookies. Ingredients: cocoa butter, rice powder, sugar. These have mixed reviews. Some people love them, some people hate them, but there doesn’t seem to be any in between. If you like sweet things, you'll probably love this white chocolate bar. Ingredients: Vegan Cane Sugar, Cocoa Butter, Sunflower Lecithin, Natural Vanilla, Dextrose, Tragacanth Gum (Natural Thickener), Natural Flavor. This is sort of like a vegan white chocolate crunch bar. The crunchy part is what really makes this the best. It adds texture and a little bit of a subtle salty taste. Ingredients: Cacao butter, cashews, quinoa, cane sugar, chia seeds, brazil nuts, almonds, vanilla bean powder, sea salt. If you’re looking for an array of white chocolate flavors the Whelpdale is a pretty good place to look. They have savory-sweet white chocolates, fruit white chocolate, and a mint in addition to their original. 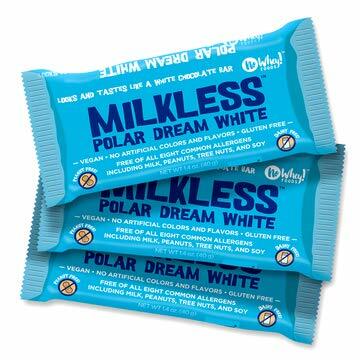 Many people claim that this is the best white vegan chocolate bar they've ever had. It's quite expensive per bar -- but it might just be worth it! Ingredients: Organic fair-trade cocoa butter, fair trade organic raw cane sugar, organic rice syrup, organic vegetable oil (sunflower oil), organic vanilla, sea salt. 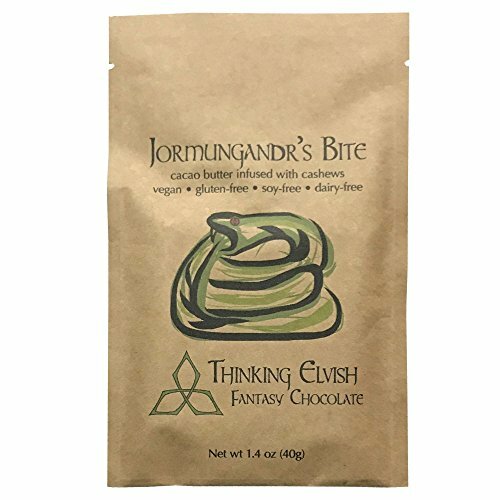 This is vegan white chocolate with a fantasy theme. It's got a simple ingredient list with some added cashews for richness. Ingredients: organic cacao butter, organic cane sugar, organic cashews.